Bomarsund is a village in Northumberland, in England. 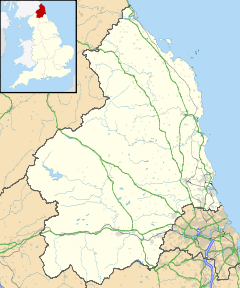 It is situated to the north of Bedlington, and just south of Stakeford. The village grew around a coal pit opened in 1854 and was named after the battle at the fort of Bomarsund in Sund, Åland Islands. It is now home to the Northumberland Brewery. Bomarsund won the National Village Cricket Championship in 1974. They beat a team from Collingham, Nottinghamshire by three wickets in the final, which was played at Edgbaston, after the original match at Lord's was rained off. ^ Wisden Cricketers' Almanack (1984) p. 332. London: John Wisden and Co Ltd. This page was last edited on 1 March 2018, at 00:30 (UTC).